Drape: Drapes are available in a wide range of colors and fabrics. They can be accessorized with black-tie sashes, sheer overlays, signage, and more. Wedding drapes, satin drapes, and theater drapes are just some of the many types of drapes. Crossbar: This is the horizontal drape support rod that is typically adjustable in width. The narrowest models generally start at 3 feet wide, and the widest go out to 14 feet in width. Upright: The Uprights are your vertical pipes, and can either be Fixed Height (one piece), Break Apart (2 shorter pieces that connect together, making transportation easier), or Adjustable / Telescoping. Base: The base is the sturdy foundation of a pipe and drape display. The weight of the base will depend on the height of your Upright, as well as the weight of drape that you choose. Rubber Base Weights: Base weights are recommended for taller displays, backdrops that have heavier drapes, or set-ups that are being used in heavy foot-traffic areas. They add extra weight to your base plates, helping increase the stability of the structure. Extras: Accessories like a valance header on a crossbar pipe and backwall hangers for more fabric layers can enhance your backdrop further. Those are the basic terms for the parts involved in a typical pipe and drape display. Other important terms you should know are humps and fullness. Humps: With traditional pipe and drape, the crossbar connects into the upright to where the top of the upright pipe extends a bit higher than the crossbar. This causes the gathered drape fabric to stop at this point, and results in a "hump". This can be avoided by using hardware that allows the crossbar to sit flush with the top of the upright pipe, such as DuraTop. Fullness: This is the degree of bunching of the drape fabric. If you use an amount of fabric equal to the width of your crossbar, then the drapes would have zero fullness (it would be flat, with no bunching). Using an amount of fabric width that is greater than the width of your crossbar will result in fullness, giving your backdrop a fuller, more pleated look. The degree of bunching increases based on how much more fabric width you are using on the crossbar compared to the crossbar’s width. 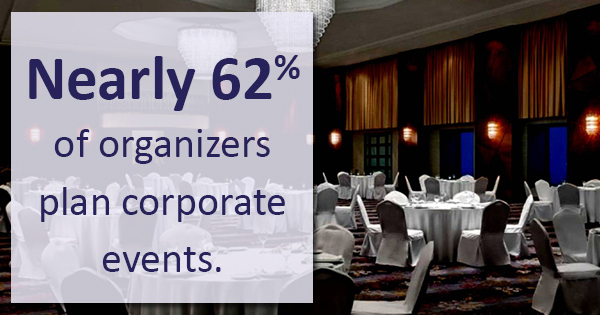 Nearly 62% of organizers plan corporate events, making them the second most popular type of event to plan. No matter what type of event you're having, pipe and drape will make an excellent addition to your day.